Note: Melvyn Bragg interrupts a lot in this segment and often appears to do so without a fully formed question in mind. So, I've dealt with this in two ways, either typing out what I believe he meant to say based on the context of the discussion and the replies, or failing that cut out the interruptions. 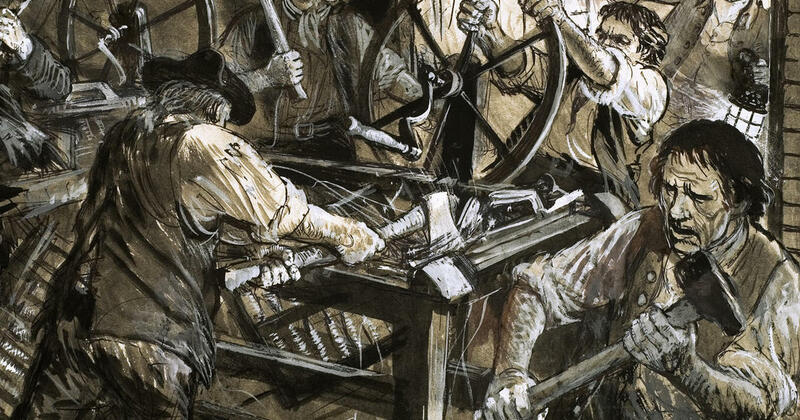 In addition while this talk on Peterloo is important particularly as it relates the other events of political and economic change that surround the meeting on St. Petersfield it does still contain some myths which I've decided to respond to via footnotes. 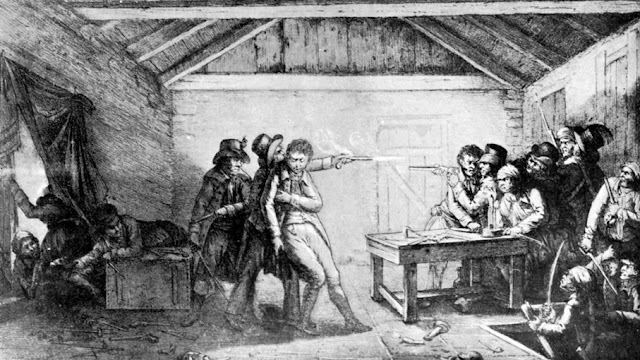 of peaceful demonstrators in 1819.
outrage and condemnation of the government’s role in the massacre. about the Great Reform Act of 1832? movement is actually indigenous and looks back to earlier British traditions. that in a way provides the context, the long context for Peterloo. a really serious threat going on. wide springing of a popular conservatism. 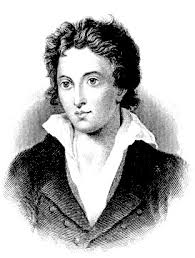 I’m thinking principally of say Thomas Paine’s The Rights of Man. is something that clearly the working-class radical movements pick up on. being born, where by being born were given you. that, that can be recognised. into political action especially up in the north. be called revolution in this country. 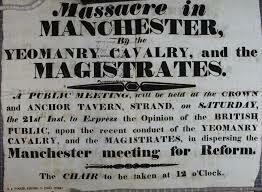 Are we still talking of around Peterloo time? political tinge which they don’t understand. the Manchester Patriotic Union Society? they’re really trying to get reform on the agenda. Henry Hunt, can you tell us something about him? hat to come and address them. Sorry Jeremy you want to say something? has a very powerful reforming-the constitutional reforming tradition. no weapons and so on. through to the speeches and then what happened? to the speakers and peacefully. the platform in order to begin their speeches about 1:30. This is Hunt with his white top hat and Carlile? so they’re also in the square. no police force so therefore, they want their own militia in order to control disorder. So, these are chaps on horses with sabres? the crowd resist and try and stop them from getting to the platform, link arms. seventeen and over six hundred wounded. I think that that’s entirely believable. and then what part the Hussars play. of what the Yeomanry did. regular cavalry being ordered not to do that, specifically not to do that. good swordsman on a horse. that something had happened in the provinces. The Times reporter got arrested. then which, which had an importance? two and half years in prison, Richard Carlile newspaperman six years in prison. years. So, in that sense the clampdown continues. The seditious libel being the account of the meeting? order to further repress the press. 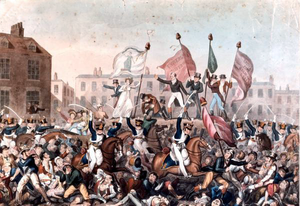 repression were introduced as a result of Peterloo. with this? Presumably it was passed around. emotional response because it was such an appalling mishandling of a situation. aftermath of Peterloo if you look is that actually the government gets its way. the Cato street conspiracy. Just tell us why that was important Clive. links in 1816 and 1817 who went by the name of the Society of Spencean Philanthropists. 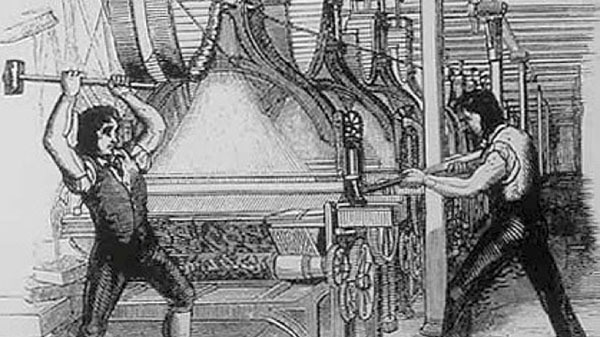 industrialisation and there should be equality. incensed and say something must be done. They plot to kill the cabinet at a cabinet dinner. still why did it take so long? popular activism and for political change is a complex one. is the straight answer why you don’t get reform until the 1830s. can you just amplify that into two paragraphs? superior and the English being superior to everybody in Europe. So that is, that conservative populism slowed it down a bit? Black thank you very much indeed and next week we will be talking about Heaven. 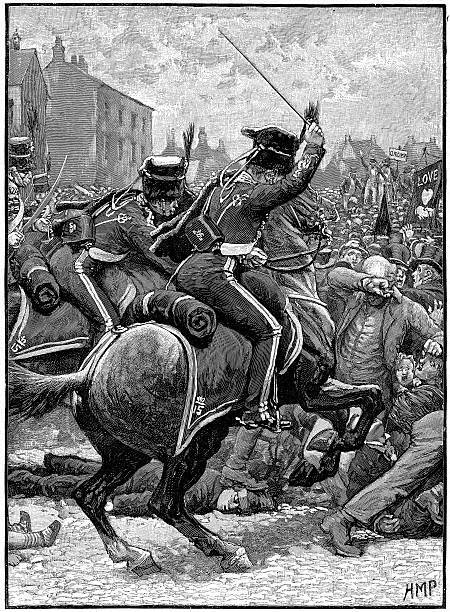 1: There is a myth about Waterloo that lays the blame for the violence squarely on the shoulders of the Yeomanry, a volunteer militia while laying praise on the regular military for discipline and restraint. 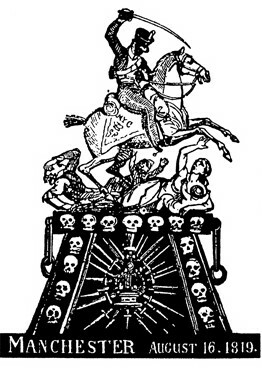 There is strong evidence that individual members of the Hussars and infantry behaved more humanly, Lieutenant Joliffe whose account was very important in exposing the establishments version of events as largely fictitious also contains references to the army attacking and dispersing the crowd. Additionally many of the wounds in the casualty lists included blows to the head from special constable truncheons or bayonets which were used exclusively by the regular infantry. 2: I don't understand the point that's attempting to be made here, first the number of slashing wounds recorded and eye witnesses show that most Hussars seem to have ignored this order. Second, using the flat of blade while very difficult is not a benevolent act. In addition to the conceded dangers of the edge of the sabre, cavalry sabres had weight to them so even if a person is not cut by a blow from a sabre the act of being struck is still highly injurious. 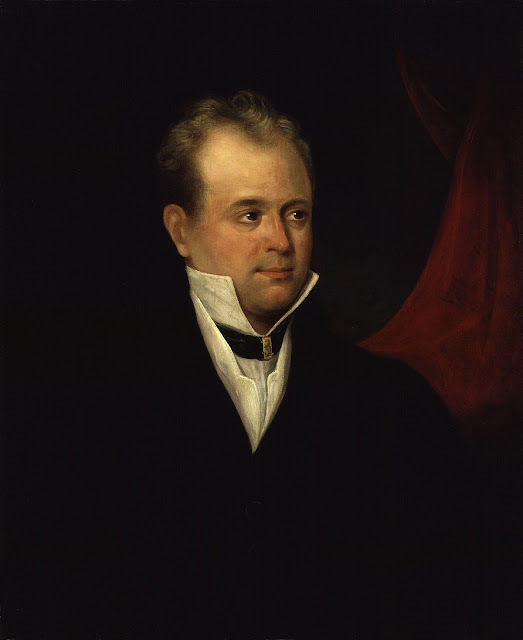 3: Generally speaking the more outspoken reforming MPs tended to be Whigs, and it would be a Whig government that passed the Reform Act of 1832. 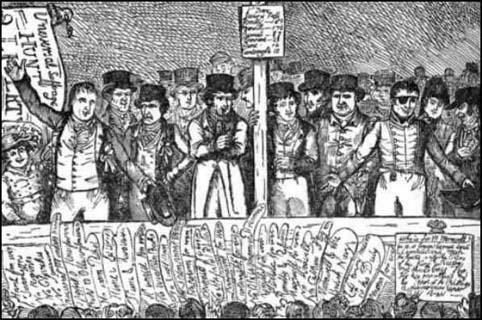 However this was far from unanimous, much of the opposition to the Six Acts by Whig MPs was less concerned with civil liberties and more motivated by fears of it enflaming insurrection. 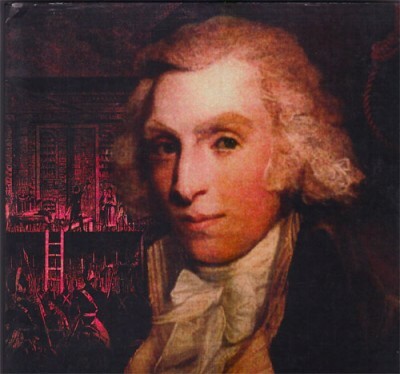 And the prosecution at the trial of the Peterloo speakers was one James Scarlett a Whig MP.